Yup, Google is back to its April 1st tricks, and they're going all-out this year. The video sets up an augmented reality game that lets you go out into the world and catch "real" Pokémon through you phone's camera. That's the April Fool's joke. But since this is Google, it doesn't just end with the video - as of right now, Google Maps on Android and iOS is actually populated with Pokémon creatures all over the world. Zoom in to major cities and you'll see Nintendo's little critters hanging out on the standard map view (you have to zoom in really far). 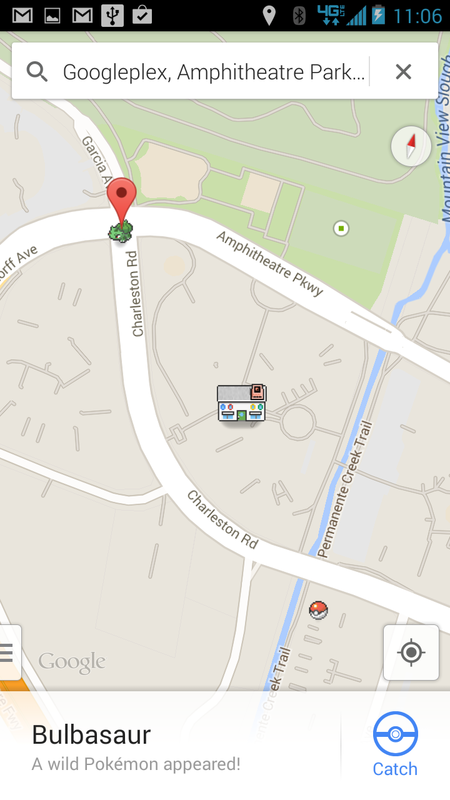 Some places, like the Google headquarters, also have pixelated buildings overlaid on the map. Tap a Pokémon and you can "catch" it, adding it to your own personal Pokedex (a monster catalog from the game series). 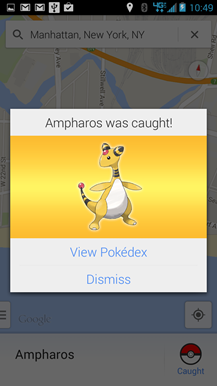 "Catching" a Pokémon will populate your Pokedex with a portrait, game-accurate statistics, and flavor text. Pokémon fans, feel free to go completely nuts. There are 150 Pokémon that can be caught, though we're seeing some of them that aren't from the original Red/Blue/Yellow generations. 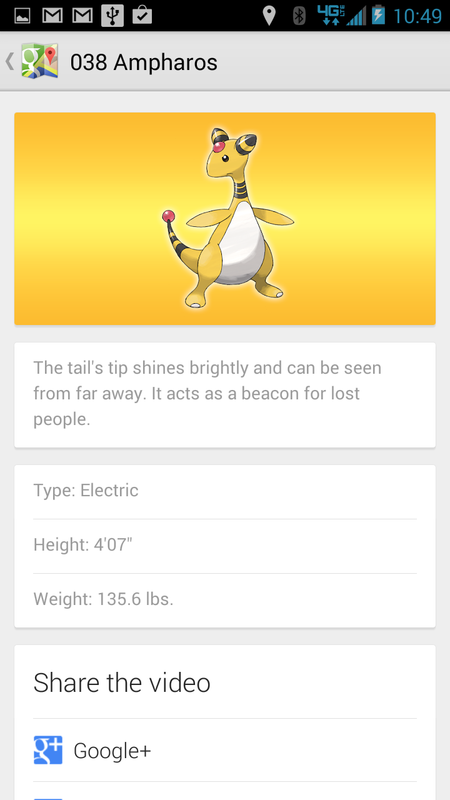 You can get back to your Pokedex by tapping the Search field while it's empty. 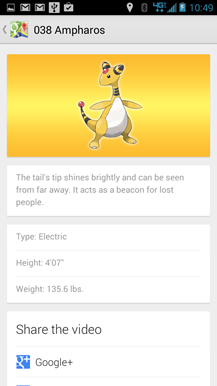 The location of each Pokémon is not searchable, but they're persistent, showing up in the same places for each user. That means it should be possible for players to work together and catalog locations for each Pokémon. 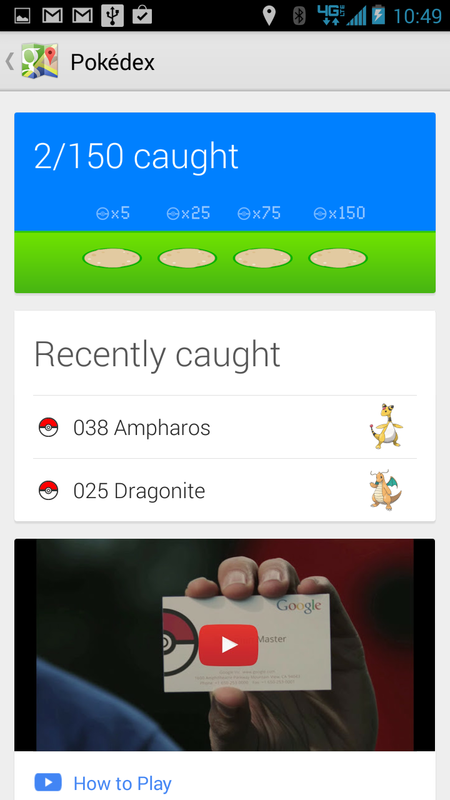 That's right - you can catch 'em all. If you can't find a Pokémon near you location, search for "Googleplex" and zoom in. There are a bunch of them just waiting to be caught.